MySpace morning man Randy Andy, 45, said Ghadafi, or “MG” as fans call him, is “pumped for a new album and tour”, even though he hasn’t released anything since his hit single, “Chad”, back in the ’80’s. “MG – Mommy – is pumped for a new a new album and tour, and his doctors say he’ll be able to perform 10,000 shows at London’s 02 stadium next month if he isn’t assassinated by some hater first,” Andy went on. MySpace has been courting the Middle Earth heavyweight ever since people forgot about it (MySpace). “FaceBook and Twitter have that Mark Zuckerberg guy in their ads and Steve Jobs, Google has Obama…Ghadafi is basically the only celebrity left,” a spokesperson from MySpace said, on the condition that they not be named in this article because we made them up. Hey, how should we spell Ghadafi’s name? 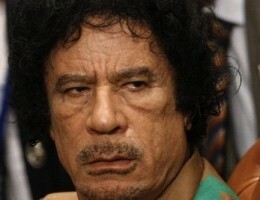 Is it Ghadafi, or Gaddafi, or..? But, hey, how about that guy…what’sisname? This entry was posted in Latest Brutality and tagged daemon mailer, dennys, facebook, libya, mark zuckerberg, middle east 2011 revolutions, myspace, MySpace backing gaddafi in social network war, obama, steve jobs, the brutal times, twitter. Bookmark the permalink. I am a MySpace user, and I want to know if the global war on terror is going to affect my band’s friend count? I couldn’t decide whether you were trying to be unfunny or were just unfunny. I also think it’s rude to post pictures of Michael Jackson after his death. Plus, he was never funny in life, so it doesn’t compute, if you think about it. He needs to go to Top Cuts! Tee hee hee!!! !